Softening financials and profit downgrades are beginning to reflect strategic weakness at Skymark, Japan's third-largest airline that is still an entirely domestic-only carrier – but with significant expansion plans that over the next two years includes introducing A330 and A380 aircraft. 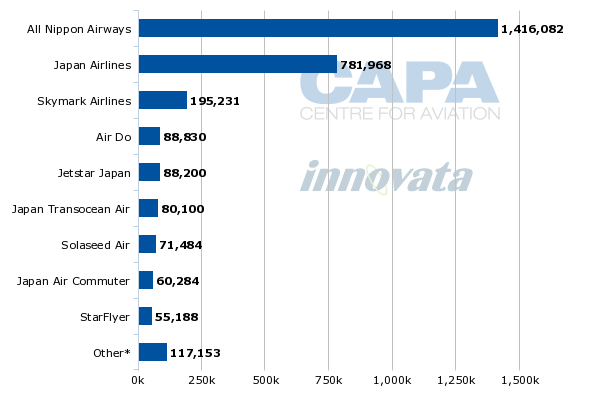 Skymark increasingly looks caught in the middle of, at the top end, full-service carriers All Nippon Airways and Japan Airlines, which have wide networks, affording them considerable scale. That is something Skymark – one quarter the size of JAL, and less than a fifth the size of ANA – cannot match. At the bottom end are Japan's new-entry low-cost carriers that are much smaller than Skymark but growing with a lower cost base. 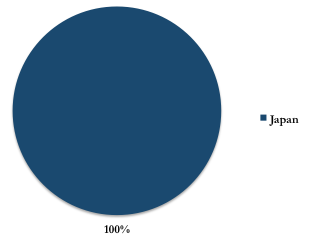 Skymark cannot match the low-cost of the LCCs or the premium and network advantages of ANA and JAL. It has succeeded so far in securing slots at the convenient Tokyo airport of Haneda, but this advantage is drying up. While Skymark management has a mindset worlds away from the bloated legacy views that brought JAL into bankruptcy, Skymark has yet to capitalise on this to become an efficient hybrid carrier open to global partnerships – a possibility that could re-define Asian aviation. The fiscal year ending 31-Mar-2013 (FY2012) was not kind to Skymark as a 26% increase in operating costs (fuel up 29%) offset a 7% increase in revenue. Profit fell 70% to JPY4,674 million (USD56.3 million), but this being aviation, it should be pointed out that was a profit and at a not too shabby margin (relatively speaking) of 5.4%. But there was more to this story than rising fuel costs; revenue grew 7% despite Skymark carrying 15% more passengers, a cautionary decline in yield. LCCs are impacting Skymark's yields and, on the cost side, Skymark is spending more on advertising and distribution. Skymark is projecting a stronger FY2013 with a 6.0% margin as revenue and profits grow. But the end of the current financial year, as well as FY2014, may bear the brunt of Skymark's introduction and ramp-up of A330s and A380s. 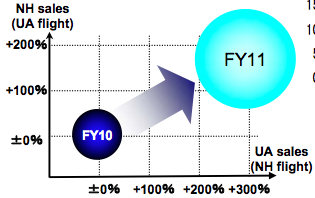 But before thinking of FY2014, Skymark may have a challenge to meet FY2013 projections. 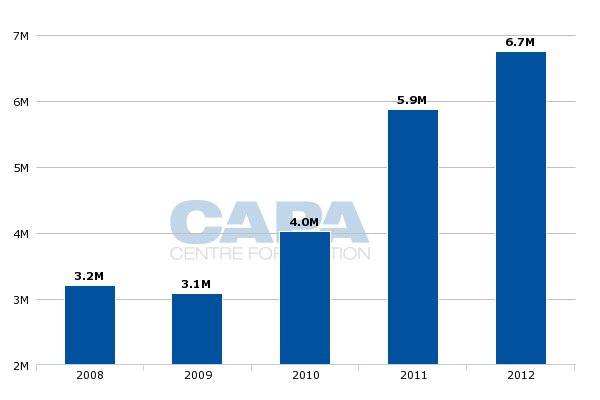 Capacity in FY2013 is trailing FY2012. Skymark was sorely off FY2012 expectations: revenue was short JPY14,000 million (USD138 million). Costs were broadly in line; actual costs were lower than projected but due to lower passenger volumes. Skymark boldly predicted an operating profit three times what it actually achieved. Such misguided projections, mainly on the revenue, not cost, side, indicate the amount of change occurring in Japan. More worrying perhaps is that management may it is not susceptible to these changes, setting the stage for a carrier in need of strategy refinement. Skymark is one of a few carriers collectively known as the "new entrants" and at varying times is referred to as a LCC although it is closer to, and positions itself, as a hybrid. Its main business strategy has been to use its lower cost base to challenge ANA and JAL on trunk routes, primarily from the convenient downtown Tokyo airport of Haneda. As Haneda has expanded its precious slots, the government has ensured new entrants, bringing competition, have been able to have a fighting chance. Skymark's CASK is below JPY8 (USD7.9 cents) while ANA and JAL are around JPY11-12 (USD10.8-11.8 cents). The difference is substantial enough at first glance, and considerably more so when considering ANA and JAL's CASKs include their extensive long-haul networks, which operate at a much lower unit cost than short-haul flights, thereby dragging their average cost down. The difference in CASK of ANA and JAL compared to Skymark on a same route basis would be even more stark. The vast bulk of Skymark's flights is well under two hours' duration, while JAL for example has a weighting well above that. Skymark has this lower-cost position to gain passengers on trunk routes from Tokyo's convenient but slot-restricted downtown airport of Haneda. Japan policies have explicitly favoured Haneda slots to new entrants, although ANA and JAL historically received the majority. 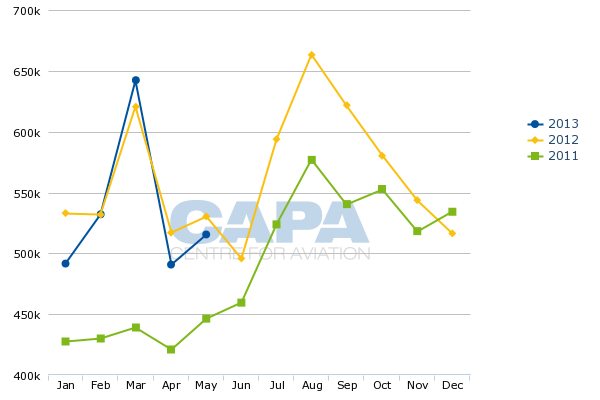 But Skymark is beginning to reach saturation in the number of Haneda slots it can ask for and receive. This was shown by the slot expansion announced in 2012 that saw Skymark receive only four slots while ANA received eight and up-and-coming StarFlyer five. Further, Haneda slot allocation is less than transparent for the future, as a large expansion around 2015 (the government has yet to set a definitive date) may give greater access to carriers like StarFlyer, which operates on some trunk routes too. StarFlyer has flagged that its future growth is dependent on further Haneda slot access. There are a number of other, smaller carriers like Air Do and Solaseed that maintain their business but without a defining strategy. Yet a drastic change, not expected in the short-term, could see them become greater competitors. Until 2012, Skymark had a fairly easy market position. It had about 50% more Haneda slots than its next competitor and was largely the only game in town for passengers wanting lower air fares than those ANA and JAL provided. But the 2012 entrance of LCCs, even if flying from the more inconvenient airport of Tokyo Narita, saw the lower end of Skymark's segment go to LCCs. Skymark attributed a decline in load factor on the Tokyo Haneda-Fukuoka route from 95% to low-80% to incumbent discount pricing – but also to the entry of LCCs. 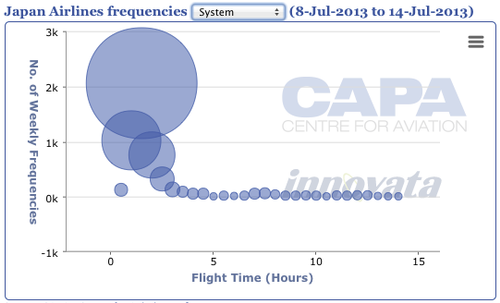 And at the top end of the market, JAL was becoming more efficient and lowering its cost. In 2012 Skymark made bolder moves to target both the LCC and corporate sector. Skymark has a mixture of leisure and business passengers and is trying to build up its market in the latter. Skymark is the third-largest carrier at Haneda, albeit by some distance, and tries to challenge ANA and JAL on frequency on trunk routes, which see both leisure and business traffic. One move was not completely successful. The Japanese market was learning token examples of how LCCs could be low-cost without compromising safety. The example from Peach often cited by passengers is that they are asked to raise the armrests when de-planing to allow a faster turnaround time. To remind the market it too had low-cost elements, Skymark unwisely said it would not respond to passenger complaints. That, of course, did not receive a warm welcome in service-minded Japan (or in foreign markets, either). To appeal to corporate markets, Skymark introduced flexible tickets that allowed free changes anywhere from 14 days (less expensive tickets) to one day (more expensive) prior to departure. Combined with easy cancellation/refund charges, Skymark wanted to be seen as reaching out to the under-served segment of reasonable fares with flexibility. That objective also found resonance with leisure travellers taken aback by the LCCs' strict ticket rules. As other LCC/hybrid carriers have seen a market to offer a more affordable premium product with their lower cost base, Skymark plans to introduce a premium seat option – details still forthcoming – on its current all-economy 737-800s seating 177 (short of the certification maximum of 189 seats.) Skymark will not need considerable end-to-end investment; lounges, for example, are not a focus point for service given the precision of public transport enabling passengers to arrive at airports right before flights. The aircraft will be closer to a normal multi-class configuration than all-premium predecessors. Indeed, at 271 seats on Skymark’s A330-300, the aircraft is on par with other operators' configuration. Within Skymark’s region of North Asia, Asiana fits 296 on its A330-300 and Korean Air 276 in a three-class A330-200. In a more dense domestic configuration, Air China fits 313 on its A330-300. The denser configuration means Skymark can stimulate greater demand; the product will have mass-market appeal owing to its lower cost. Skymark is tentatively naming the product "Green Seat", a clever link to the more spacious seats offered in the "Green Car" on the shinkansen, Japan's high-speed railway. While Skymark may find success with its domestic product on the A330s – for which six will be delivered – there are concerns over its future to operate all-premium A380s. 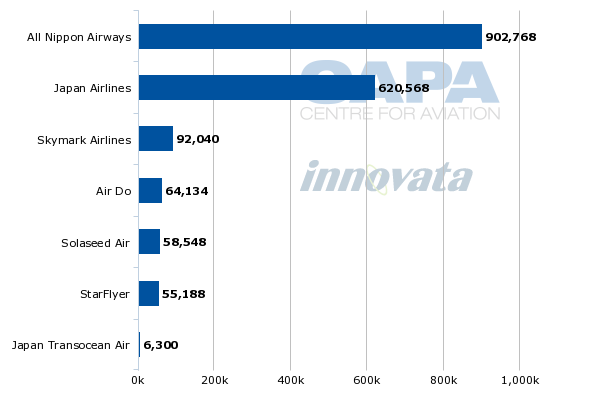 The density of those A380s will be far lower that competitors and out of proportion with the density on other long-haul aircraft that Skymark will compete with, including foreign carriers that have a lower cost base than ANA and JAL. Skymark plans to use the A380 from Tokyo to New York and later London. But these routes are not of the scale of Tokyo-Fukuoka, the first route for Skymark's A330. Not only does Tokyo-London/New York see lower volumes, there are a number of one-stop options if looking for a lower ticket price. Whereas the A330s will be deployed in a closed environment where the competition has a high cost base, the A380s will be in an open market where competitors have lower costs, eating away at some of the clear cost advantage Skymark will have in the domestic market. The trans-Pacific and European routes from Japan have a competitive outlook not just about ANA and JAL but also their partners. ANA and JAL have JVs to the US and Europe, increasing their scale. 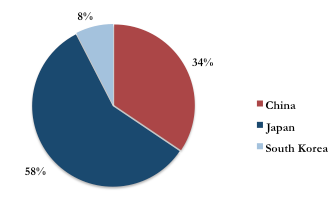 And JAL's position in Europe was advantaged with the Jul-2013 announcement that Finnair – accounting for about 10% of Europe-Japan capacity – intends to join JAL and British Airways in their JV. Skymark is becoming awfully lonely, not only from a lack of strategic, operational partners but even marketing partners; it has no loyalty programme, let alone one with international partners to increase its worth, following the strategy of airlines like Etihad and Virgin Australia. Skymark may have trouble competing at the upper end of the market (long-haul), and its short-haul market mainstay is no longer the guaranteed staple it once was. While the new LCCs are still gaining scale and positive market perception, with time they will do well and could have cost bases under JPY5 (USD4.9 cents). That threatens Skymark at the lower end, and the carrier has already pointed to load factors decreasing because of the LCCs. So Skymark has neither the highest yields nor the lowest costs and is entering shaky new business segments without its old core to rely on. 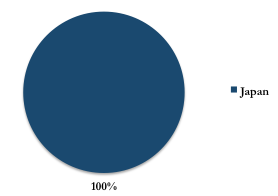 Global evidence shows taking costs out of an existing business is difficult at best. Transforming into a LCC would be equally challenging. So if you need to move but cannot go down, you need to look up. Skymark may find itself in a position of being “stuck in the middle”, having a cost base higher than LCCs but a scale too small to compete with ANA and JAL. It must find a niche that complements its capability. It will never be the size or have the scale of ANA or JAL. Nor does it have their partners let alone alliances to not only receive feed but also make loyalty strong. But this can theoretically change and there is precedent, albeit very small scale, in the partnership arena with allowing Delta’s Japan members to redeem miles on Skymark flights. Delta very publicly lost in its attempt to woo JAL to SkyTeam from competitor American's oneworld. Delta remains on the trans-Pacific without a strategic partner. Fellow SkyTeam carrier Korean Air in 2012 mooted a JV with Delta, but nothing has come of that, and anyway Delta's foot is firmly in Japan, not Korea. 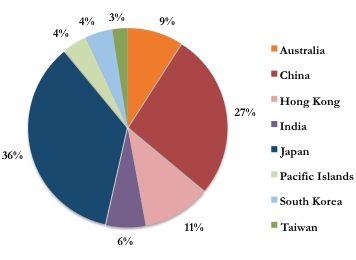 Japan accounts for about 80% of Delta's US-Asia seats. Delta is without a trans-Pacific/Japanese partner while European counterparts Air France-KLM are without a Japanese partner. Like Delta, they are also not considerably close to Korean Air. 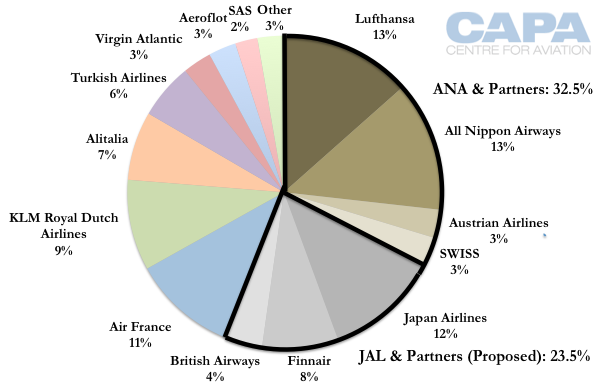 AF-KLM have done well, accounting for 20% of the Europe-Japan market compared to the 24% JAL-BA-Finnair have. No doubt though they would like a local friend. There are a number of other airlines from various markets that could do with a Japanese partner but have not secured one either due to alliance lines or because ANA and JAL have such high cost bases that feed, and thus the partnership, would be limited. Already the Japanese JVs are limited for transfer traffic beyond Japan because ANA and JAL's cost base is too high. Japan's future as a transit hub is limited. The cost base situation is dire enough that ANA is looking to purchase foreign airlines to secure new growth options. And existing partnerships could change if Skymark, with its lower cost base, came into the picture. This future will be up to Skymark. It wants to shake the status quo but still has flavours of a legacy environment. Skymark’s management is described as having demonstrated innovation in other sectors, like IT, and finding the status quo of aviation in Japan (namely high cost and low service considering the price) unacceptable. Management wants to bring change and are arguably the best equipped in Japan to do so, owning a lean structure but also the right management mentality. There are further permutations if Skymark makes IT changes and embraces partnerships, let alone the potential for SkyTeam to finally have a Japanese member. 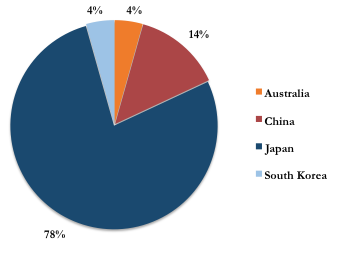 With promise of feed as well as coaxing from partners, Skymark could enter the regional Asian market, which within and to/from Northeast Asia is still limited in terms of options, let alone cost-efficient options. It is a practical if long-term possible development. 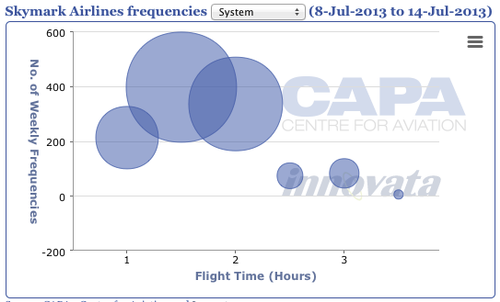 North Asia is starved of efficient and low-cost full-service airlines, perhaps with the exception of Cathay Pacific. 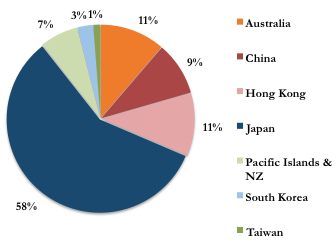 The Chinese carriers are capable of low cost bases but have too much inefficiency. 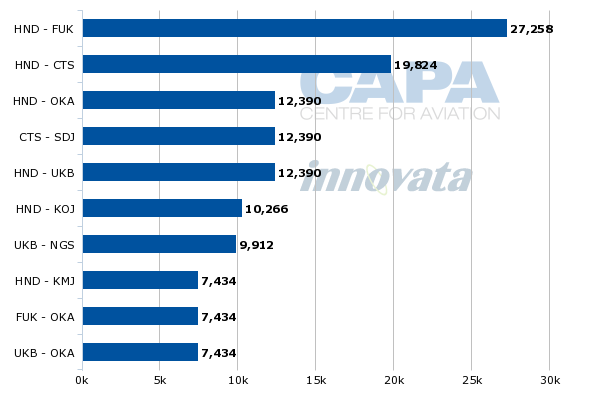 Asiana and Korean Air have lower costs than ANA or JAL, but are still high. Skymark would have a clear cost advantage and has already found traction in having a low-cost base without LCC-style service that irks the market. LCCs may be growing in North Asia, but hybrid carriers when done well, like with JetBlue or Vueling, find success. Skymark could have a slightly higher cost base but with enough service for passengers to justify it. For now, Skymark is still a domestic airline, save for a few international charters. Japan needs a third major airline, not just because of the country’s size but because of stagnation that has occurred: Japanese are very loyal to ANA and JAL, and this has come at the expense of innovation. For example, ANA and JAL were some of the last major carriers to install lie-flat seats in business class – and their long-haul flights stretch to 12 or more hours. Japan could use a third major airline to give a much-needed boost to the tourism sector and larger economy, especially if Skymark one day has a role in bringing in more connecting traffic if it finds partners. In theory Skymark has all the right ingredients. It recognises it needs a different position, both in the market and with its management mentality. And the latter should not be under-estimated in inertia-filled North Asia. Skymark has also demonstrated a lower cost base than ANA or JAL. But in practice Skymark’s position could use more development, and this will be to its benefit – and perhaps even necessary given imminent arrival of the A380s. A basic partnership will surely be necessary for long-haul ambitions, and once the first partnership is set up, the rest come easier. But do not under-estimate the time that would be required for this, if it eventuates. Skymark is showing signs of breaking from the Japanese mould – A380s, all-premium domestic aircraft – but these are experiments with high capital expenditure. Some cheaper ones would be to its advantage. The necessity of partnerships has surely been made clear by now. Making change is welcome, but Skymark may not have found the right measures yet. While there is perhaps time to continue experimenting, the stakes are growing as competition increases and Skymark pours more cash into its business.